The most reliable hydroponic setup on the market - 1 million+ happy users and counting. Operates on a 120/240V, 50/60 Hz power supply. Exclusive Soft Start Technology: allows multiple ballasts to start at the same time. Has a continuous power factor of 99.9%. With high frequency output results in less power loss. Can withstand a wide range of voltage fluctuations from 98V to 268V and still supply a constant voltage to the lamps. Highly reflective German aluminum maximizes the light reflected to the plants. Sturdy housing is highly resistant to rusting and damage. More transparent glass maximizes lumen output. Optimized spectrum and high PAR (Photosynthetic Active Radiation) to promote healthy plant growth. Robust stainless steel armature versus nickel plated steel, far stronger and longer lasting. warranty and provide friendly, easy-to-reach support. Ballast: Provide consistent, stable power to the lamp for ultra bright, high intensity and a quality spectrum. Reflector: Made from highly reflective German aluminum and galvanized steel. 7-Day Dual Outlet Timer: Control light system & ventilation system simultaneously. 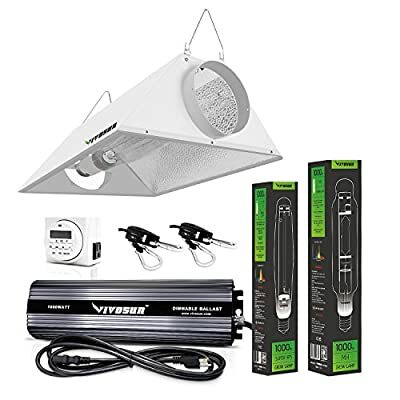 What You Get: VIVOSUN 1000w HPS & MH bulb, 1000w digital ballast (8ft 120v power cord), reflector, a pair of 1/8" rope ratchet hanger, 7-Day dual outlet timer, our fan-favorite 3-year warranty (Ballast only) and friendly customer service.